William Walter, Second Lieutenant – 6th Indiana Cavalry, Co. B (71st Regiment) (Commissioned by Gov. Morton on 01 July 1865 when John J. Carter was promoted to First Lieutenant); Enlisted from Fremont, IN as a Private – 5th Indiana Cavalry, Co. M (90th Regiment), promoted to Corporal in 1863; promoted to First Sergeant on 01 September 1864. Wounded by ball above right ear at Battle of Buffington Island permanently “losing the ear”, in pursuit of John Hunt Morgan. Prisoner of War – captured at Maynardville, TN in Dec. 1863– escaped March 1864 & reported to Maj Gen Crook in Wheeling, West Virginia April 1864. Was captured twice more by the Confederate Army and escaped twice – appears to be after regiment was surrendered by Gen. Stoneman. Company M, 5th Indiana Cavalry transferred to 6th Indiana Cavalry in 1865 to complete terms of enlistment. REGIMENTAL HISTORY: Ninetieth Indiana Regiment (5th Indiana Cavalry). — Cols., Robert R. Stewart, Felix W. Graham, Thomas H. Butler; Lieut. -Cols., Josiah Forth, Thomas H. Butler, John Woolley; Majs., Felix W. Graham, John S. Lyle, John Woolley, Joseph R. Haugh, Chauncey H. Thompson, Moses D. Leeson, Mell H. Soper. This regiment was organized at Indianapolis in 1862. Four companies were mustered in in August, five in September and three in October. Robert R. Stewart, who had been commanding colonel, declined the position and Felix W. Graham, who had been commanding major, was made colonel. Cos. C and F were sent to Carrollton, Ky., and Co. I to Rising Sun, Ind., in October, remaining until December, when they moved to Louisville, later to Munfordville and Glasgow, joining the regiment at the latter place in March, 1863. The other companies were sent in December to border counties, A and G being located at Newburg, B at Rockport, D and L at Mauckport, E and H at Cannelton, K at Mount Vernon, and M at Evansville. These companies moved to Louisville in Feb., 1863, and to Glasgow early in March. Reunited, the regiment was kept busy in scouting the country until April 17, being in several skirmishes and burning the town of Celina, Tenn. It was in heavy scouting and skirmishing until June 22, capturing many prisoners. On July 4 it started in pursuit of Morgan's raiders and finding them at Buffington island, attacked and drove them in every direction, killing and capturing many and securing 5 pieces of artillery. Returning to Glasgow, it started on Aug. 18 for East Tennessee and reached Knoxville on Sept. 1, being the first regiment of Union troops to enter that city. It was in an expedition across the Smoky mountains and on its return moved to Greeneville. It was then in an expedition to Bristol, being engaged in heavy skirmishing and the battle near Zollicoffer. It was also in an engagement near Blountsville and captured a number of prisoners. While marching toward Loudon and Bull's gap the regiment met 3,000 of the enemy near Henderson's mill and engaged in a fierce fight, holding the enemy in check in frequent hand-to-hand combats, and when nearly surrounded, cut its way through the lines and rejoined its brigade. Later, near Rheatown, it came upon the enemy's rear and engaged him again. It was in a second engagement near Blountsville, and was on outpost duty at Jonesboro until Nov. 6, when it moved to Cheek's cross-roads, thence to Tazewell, and later to Maynardville. It was in a heavy skirmish with a division of cavalry, and in heavy fighting at Walker's ford. It marched to Blain's cross-roads and Bean's station, where another fierce battle was fought, the regiment retreating towards Rutledge, and going into camp at Blain's cross-roads. On Dec. 23, it moved to Mossy creek, and remained there until Jan. 14, 1864, being constantly engaged in fighting. It participated in the battle of Dandridge, and made a charge on foot three quarters of a mile in advance of the main line of battle, driving the enemy before it. On the retreat it reached Knoxville Jan. 19, 1864, and there the horses of the regiment were turned over to the 14th Ill. cavalry. The regiment made a scout on foot to Pigeon creek, then moved to Cumberland gap, and thence to Mt. Sterling, where it was remounted. On May 1 it started for Tunnel Hill, Ga., and with Stoneman's command participated in the Atlanta campaign, being engaged in all the cavalry operations from Dalton to Decatur. Marching in a raid towards Macon in July, it took part in an attack upon the enemy and drove him 2 miles. Near Hillsboro it participated in an engagement with a body of Wheeler's cavalry and was left on the field to hold the enemy in check until the main body was entirely out of danger. Then the regiment was surrendered by Gen. Stoneman against Col. Butler's earnest protest. A part of the regiment, dismounted, had remained at Decatur and was put on guard duty with muskets until Sept. 13, when it was transferred to Kentucky, where it was rejoined by the remainder of the regiment which had been paroled and exchanged. Remounted, it marched for Pulaski, Tenn., Jan. 17, 1865, and there it remained on scouting work, capturing and dispersing bushwhackers and outlaws. It was mustered out June 16, 1865, at Pulaski. Cos. G, L and M having entered the service subsequent to Oct. 1, 1862, were not entitled to be mustered out, and, with the recruits, were transferred to the 6th cavalry, with which they served until its muster-out in September following. The original strength of the regiment was 1,242; gain by recruits, 522; total, 1,764. Loss by death, 217; desertion, 125; unaccounted for, 99. During William Walter’s first experience as a Prisoner of War, he had one of the most exciting and challenging times of his life. By his own written words, William Walter described his escape in detail. In March of 1864, his Confederate captives placed him on a train headed for the notorious Andersonville Prison. On the trip, William was able to force open the door of the boxcar that he was riding in and leaped off the train making his escape. Another Trooper from Iowa leaped off as well, but took off in varying directions. The Confederates went into pursuit with bloodhounds for the two men. William realizing that he had to break his scent and hide his trail ran for the nearby Dan River. He ran through the 4 inches of snow on the ground and dove into the river to swim across. As he hit the water he almost immediately began coughing blood up from his lungs. He struggled to swim across the river, and once he got to the other side he had no energy left to extract himself from the river. Fearing certain death in the icy waters, he felt someone grab a hold of him and pull him up on the river bank. It was a slave that had seen him making his escape and crossing. The slave brought him back to his cabin that he shared with his wife. The couple kept fed him and kept him near the fire in their cabin overnight. In the early morning they snuck him out to the woods and hid him with blankets to stay there until he had recovered enough to flee, bringing him provisions until he left. After a couple of days William Walter left and proceeded to hike north for Wheeling, West Virginia. He made his way through the mountains, fully expecting to meet his maker. He managed to commandeer several Confederate horses along the way to aid in his trek. Eventually, after a month and over 400 miles of treacherous terrain, William reached Union lines and entered Wheeling, West Virginia. 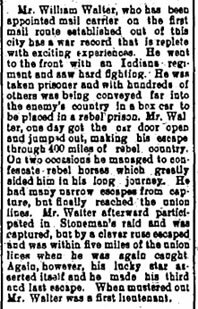 He marched his way directly to Major General Crook, reporting to him that he was Corporal William Walter an escaped POW, and that he wanted to immediately return to his Company M, 5th Indiana Cavalry. He was thusly selected to attend the Military School in Philadelphia and was promoted from Corporal to First Sergeant. While fighting in the Battle of Buffington Island, William Walter was shot in the head with a ball above the right ear. All witnesses to the wound or the aftermath in later life said that he “lost the ear”. It is still a mystery as to whether the wound took the ear off entirely, or if it was purely his loss of hearing in that ear. After he was shot during the battle, he had his head wrapped in bandages, and continued to fight rather than fall out. William Walter proceeded to move north to the Pierson area from the Michigan-Indiana border where he had grown up. He pursued work and business in lumber as many were known to do during that period of time. Later he moved to the Robinson Township, Ottawa County area to farm for several years. 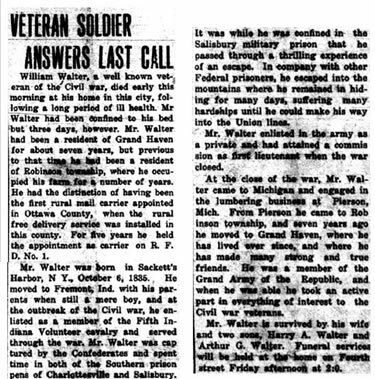 Eventually, William Walter moved into Grand Haven, and was quite active in town and was well known as a Civil War Veteran there. He joined the Weatherwax GAR Post No. 75 holding several Offices including Chaplain and Junior Vice Commander. Comrade Walter would have definitely known Robert Finch our namesake after being in the same GAR Post. William Walter continued to love riding horses throughout his post-Army life. He had the honor of being appointed the first rural mail carrier in Ottawa County, as well as holding RFD Route 1 in Ottawa County for 5 years when the Postal Service started rural mail delivery. He died at his home (which still stands today in downtown Grand Haven) on Fourth Street in Grand Haven in November 1913 survived by his wife and two sons.